NICOSIA, Cyprus Cyprus's president called on the country to "share the burden" of solving its financial crisis Friday as banks opened for normal business for the second day, but with strict restrictions still in place on how much money their clients can access. "The deal we agreed on, after the dramatic hours we all lived through last week, is without doubt painful," President Nicos Anastasiades said during a speech at a civil servants union convention Friday. "Everyone will have to make sacrifices as our financial situation, in the violent way in which it has developed, will oblige all of us to share the burden" to reform the economy, he added. Lines formed outside some banks just after opening time, but most were gone by mid-morning. Before reopening Thursday, Cyprus's banks had been shut since March 16 to prevent people from draining their accounts as politicians scrambled to save the country's stricken financial sector. The tiny Mediterranean country has imposed daily withdrawal limits of 300 euros ($384) for individuals and 5,000 euros for businesses -- the first so-called capital controls that any country has applied in the eurozone's 14-year history. 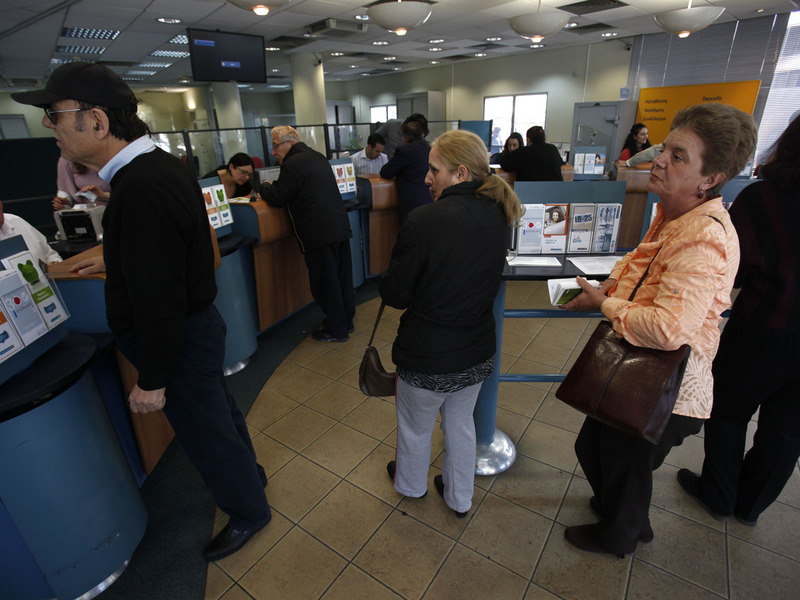 Financial strains are building on families and businesses, and the recession in Cyprus is likely to deepen. Cyprus's banks became much bigger than the country's government could afford to rescue -- more than seven times the size of the country's economy. When the banks were hit by large losses and Cyprus could not afford to bail it out on its own, the country turned to the other 16 European Union countries that use the euro. On Monday Cyprus agreed to make the banks' bondholders and big depositors contribute to the rescue in order to secure 10 billion euros ($12.9 billion) in loans from the eurozone and the International Monetary Fund. One bank, Laiki, is to be split up, with its nonperforming loans and toxic assets going into a "bad bank." The healthy side will be absorbed into the Bank of Cyprus. Savers with more 100,000 euros in both Bank of Cyprus and Laiki will face big losses -- possibly as much as 80 cents on the euro. However, in spite of the turmoil of the past weeks and harsh conditions of the rescue, Anastasiades stressed that his country's future lay firmly within the euro. "We are not going to leave, I stress, from the euro. .... We will not, I stress, endanger the future of our country with dangerous experimentation."